The pop up dinners take weeks of work, and said work usually begins as soon as the previous dinner concludes. It’s a labor of love and passion, but ultimately takes up a significant portion of my life. It all begins with a concept; not necessarily a theme, though that has happened 50% of the time now. A concept has more to do with what the final goal of the meal is – is it to teach? To share an experience? To expand my abilities? Whatever it is, that informs the main arc of the meal as a whole. The first dinner for example, was more about the experience of a pop up dinner, rather than anything particularly ambitious food wise. I stuck primarily with things I knew would work, and wouldn’t need much testing. There wouldn’t be time for that, since I had to figure out how to put everything else together. For Terrains of Autumn however, the concept was nostalgia, through and through. I wanted to create a menu that was deeply personal, and sentimental. It was an exploration of both sensory and story based flavor combinations. What could I use flavor and process wise, to evoke a certain mood? The eggplant course, with the deeply charred flavors, the smoke, the moody sweetness of the figs paired with the pepper, it was all meant to create this foggy scene of forests and autumnal twilight. 7PLATES was meant to be more giving towards the guest. There are few times when people pay a price like the dinner tickets to go out, it shouldn’t be like something available any other night of the week. This meant that each dish had to have some little twinkle about it, something that made it stand out either in taste, or presentation. Engagement was something at the forefront of my mind, how I create it and utilize it. The smoke course was, I believe, a favorite of mine and the guests. It was a plate that had flavors that easily wove in and out of each other, as well as a presentation that created a real sense of “play”. Which is what small plate, tasting menus should really have at the heart of it, in my opinion. This style of food is more about the creative, thought-provoking angle, than a sustenance one. There is nothing wrong with that, but it should be embraced for what it is. So, we have concept. After that comes…usually a lot of scribbled out notes, ripped up papers, and sticky notes over every surface of my apartment (so I don’t forget what an amazing idea dry ice – frozen – candied rose petals would be, DUH). A list of seasonal goods and flavors is the usual starting ground. Some of the list is hard and fast options that are without a doubt, Spring (think peas). Some of it is more about evocation, things that make me think, feel, smell, and taste it (floral elements). I’ll then go down through the list, and see if I can find seven stand outs. Items that would be anchors to a plate, that I can build around. Each of those stand out elements is used as a jumping off point to find depth, layers, and intensity (or subtlety). This is where the individual dishes come from. Each plate is usually developed over the course of two weeks, ish, and goes through numerous iterations. Sometimes the final product is no where near the original thought. Still, this dish is at it’s barely dressed form. Garnishes are more than just pretty little bits, they should add to it. If it doesn’t, what is the point of having it? Once the skeleton of the dish is made, and the garnishes idealized, the plate sketch comes into view, along with “touch points”. A touch point is anything that will need to be physically touched to be put on the plate; they add up quickly, as does the overall time they take to place. This is how I transition into the next step of the dinner planning: Schedules. -What if I can’t pull it off? -What if no one buys tickets? -What if people buy tickets but don’t come?? -What if people buy tickets, and DO come??? -WHAT IF I FAIL MISERABLY?????? But schedules help curb the vast majority of that anxiety, so I create a plethora of them. There is a schedule for me personally, about deadlines and due dates. Menu done by this date, dinner date published online by this one, team gathered by this one, etc. Then there is the prep schedule, for myself and the two lovely women who help me cook (Hi Angie, and Kendra), to follow for the week of the dinner. This includes all the pre-prep that will happen Sunday through Wednesday evening. There are two schedules for the night of the actual dinner; a general rundown of events for everyone to follow (show up here, do this, go home here), and a very detailed one discussing every little bit of the evening. It has a plan of attach for essentially every fifteen minutes, from 4PM until about 11PM, when we all go home. That “we” part is also an essential part of the planning; while I openly admit to a lot of naive confidence in my abilities, there is no way these dinners would have EVER come to fruition without the help of the amazing friends who volunteer. From Nick who takes beautiful photographs, to Andrew who graciously washes dishes (….and whines about it), gathering everyone together towards this goal is a genuinely fulfilling aspect. It’s the part I love most actually. The dinners wouldn’t be what they are for me, if they weren’t done with a group of loved ones. There are other little parts that have to occur too, planning out the set up of the dining room, ordering flowers, creating promotional graphics for social media, building a playlist, ordering menu cards, etc. Everything is done with the intention of setting a specific mood, vibe, whatever you wish to call it. After all of that…comes the doing. Around Tuesday, maybe at 7PM, it comes. That intense buzzing at the back of my head, the swirling knot in my stomach, the too warm feeling of nerves falling over me. None of it is particularly bad, in fact I kind of look forward to it now. There’s a sense of relief, of realness, that comes with it. “I’m doing this”, for lack of a better phrase. That’s when the real fun begins, that’s when I clock out of work on Thursday at two, and come back at three, to blast some terrible prep music (I’m thinking Good Charlotte for this round), and humbly flip a dining room around. 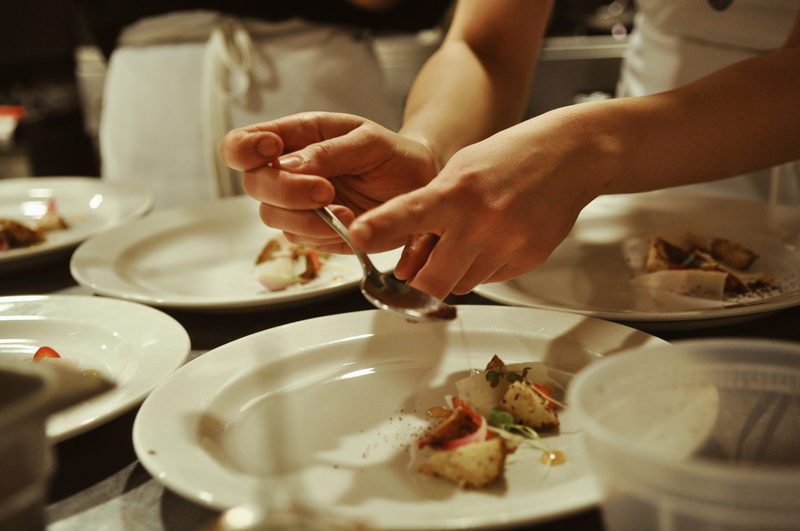 Tickets are still available for VERT – IGO, a 7 course tasting menu of Spring. Go here to grab a seat! I just stumbled on your Facebook page and then on this blog. Wow, wow, wow! I have not even tasted your food, but I am so impressed with and excited about what you are doing and that you are doing here, in little old Central PA, where it seems like cool things like this are few and far between. I eagerly await announcement of your next dinner and hope that I will be able to attend. Best of luck in your venture and I look forward to following along here and on Facebook and Instagram. Thank you so much for those kind words! Central PA is my home, and had such a bounty of amazing food and farmers, I merely hope I can do them justice. Plans for the next dinner are in the works, so yes please keep an eye on things! Thank you again, the support is so very appreciated.